How to say “bad” in Haitian Creole? 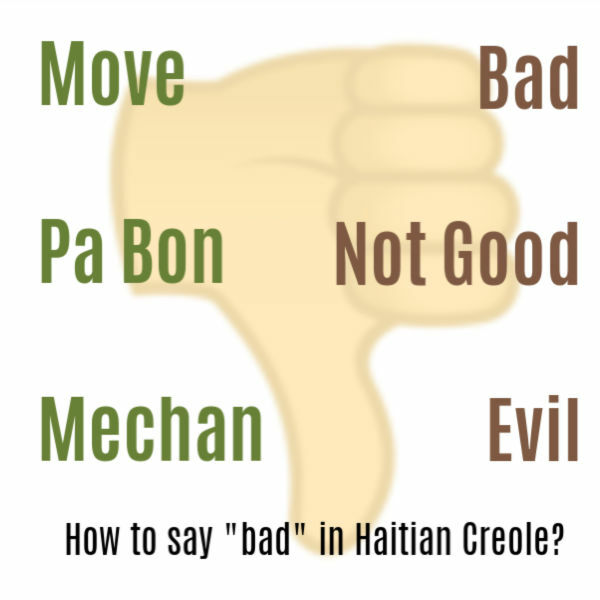 Move is a Haitian Creole word that means bad. Other common words for bad are visye, vye, pa bon, kraze. Listen to our pronunciation audio above to make sure you can recognize and speak these common words. Each has it’s own range of meaning, but in most cases move or pa bon will cover them all. Kraze, ansyen, and vye indicate an old object that is worn out. For example an old broke down car is machin kraze. Someone who has become very old is called vye granmoun. Old worn thin clothing can be call pi ansyen rad. 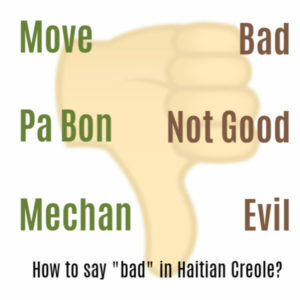 The Creole word mechan also means bad but includes a moral judgement. For example, you might call a politician mechan if you think they are corrupt. In other situations, a dog that bites would be called a mechan chen.